For the second straight year, Boca Raton FC will be featured in the American Premier Soccer League’s Fall Tournament Finals. After a hard-fought 1-0 victory over Miami Nacional on Sunday evening at Broward College, Boca Raton FC set up a date with Red Force FC for the Fall Tournament Championship. Red Force defeated Boca Raton 1-0 back on October 1, Boca’s only loss of the tournament. Red Force cruised through the Fall Tournament, going 5-0-1 (W-L-D) with 16 points while scoring 15 goals and only allowing 5. Boca Raton’s defense will have their work cut out for them with Jean-Pierre Jimenez and Alvaro Franco, who combined for 10 of Red Forces 15 goals this season, will look to add to their scoring account on Sunday at 6pm. 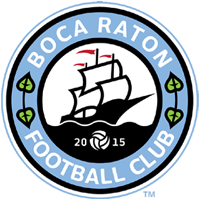 Boca Raton FC will take on Red Force at 6:00pm at Broward College (South Campus) on Sunday, November 20.